Kateys Diary: Gerry Adams tries to fight back. Gerry Adams tries to fight back. True they did fill their boots. 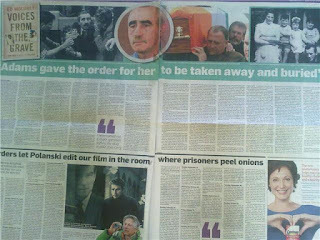 I watched nearly all the tv interviews and even bought the Andersonstown news when I saw the headline 'Adams hits back'. I was expecting a word for word critique or at least a put down of sections of what Brendan Hughes had said in the book 'Voices from the Grave'. Instead all there was in the ATN was the reproduction of a pathetic blog post on Adams own blog. In the utv news , the segment where Adams tells the reporter not to be smart with him, Adams was asked was Brendan Hughes lying, I noticed he did not say yes, but evaded the question, giving a glib answer. Of course Hughes isn't lying, it's clear to anyone who read the book that the man is lucid and totally in control of what he says. This Sunday Gerry Adams will give the oration at Milltown cemetery at the Republican plot. What will Gerry say to those gathered around Ireland's dead? Will he continue to lie and say he was never in the IRA? 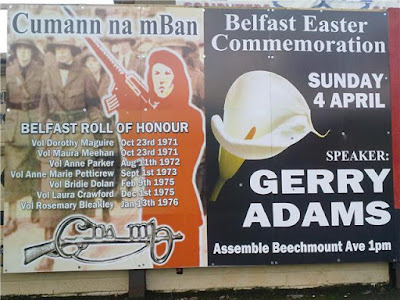 Instead Adams will defend his position that the dogs in the street know to be wrong, that he was never in the IRA. created by Kateyo at approximately 2:22 PM Categories Gerry Adams.. Belfast Brendan Hughes.